Walt Whitman cigars were the brainchild of cigarmaker and businessman Frank J. Hartmann, Sr. Mr. Hartmann learned the cigar maker trade in the 1880’s from Cuban cigar maker Raphael Perez, whom Hartmann and his family lived with at the time. In 1887, Frank moved his family from the Perez’s Philadelphia home to what is now the Cramer Hill area of Camden. Shortly after his arrival in Camden, Hartmann met Abner Benjamin Sparks, Sr., fellow cigar maker and then owner of Spark Cigars. 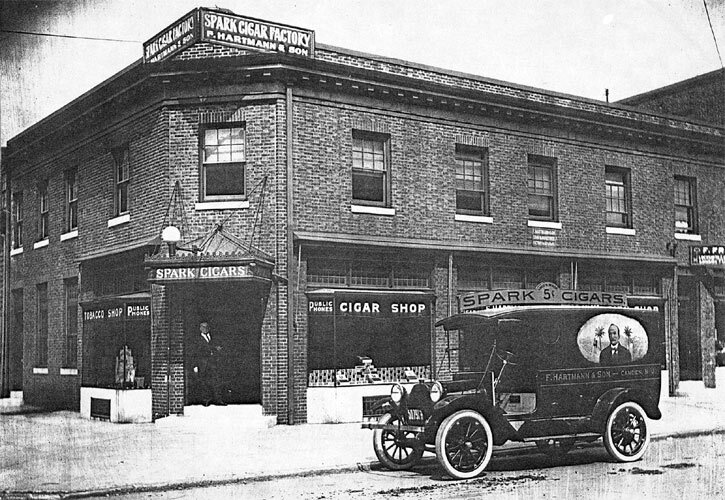 Spark Cigars was a small cigar manufacturing plant on third and Arch Street in Camden. 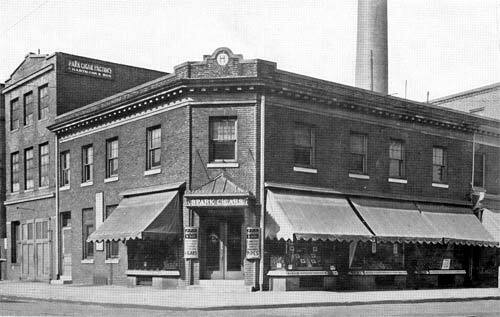 Eventually, Hartmann bought Spark’s business expanding it into a larger building encompassing the entire corner of 3rd and Arch Streets. Below are some photos of Frank Hartmann and the Spark Factory (images courtesy of dvrbs.com a full link to the site is below). Whitman feared he had not reached the common people, but his name has been used to sell cigars, coffee, whiskey, and insurance. His poetry was distributed to workers during the Depression and to soldiers during World War II. In 1957 the Walt Whitman Bridge opened between Philadelphia and Gloucester City, New Jersey. His words are inscribed in such public places as Reagan National Airport in Washington, D.C. and Fulton Ferry Landing in lower Manhattan. His image has been in cartoons and on matchbooks, postcards, and stamps. His life has inspired televison episodes and motion pictures. Hotels, buildings, plazas, camps, parks, truck stops, corporate centers, schools, AIDS clinics, think tanks, and shopping malls now bear his name (http://www.loc.gov/exhibits/treasures/whitman-legend.html). 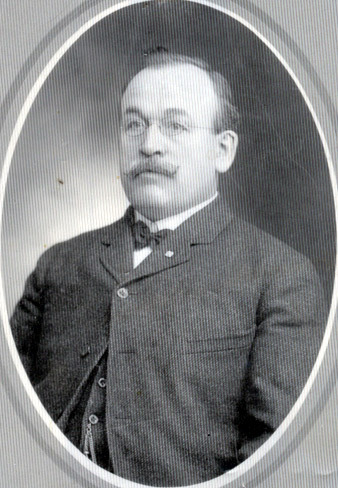 While Frank Hartmann was running Spark Cigars he was extremely active in worker’s unions. In fact, his shop was the first to use an all-union labor. Perhaps that’s one reason he chose Whitman to be his icon. Who better to represent unionized worker’s than a poet who is all about humanity and equality? Hartmann’s use of Whitman as the face of cigars was not a one way deal. 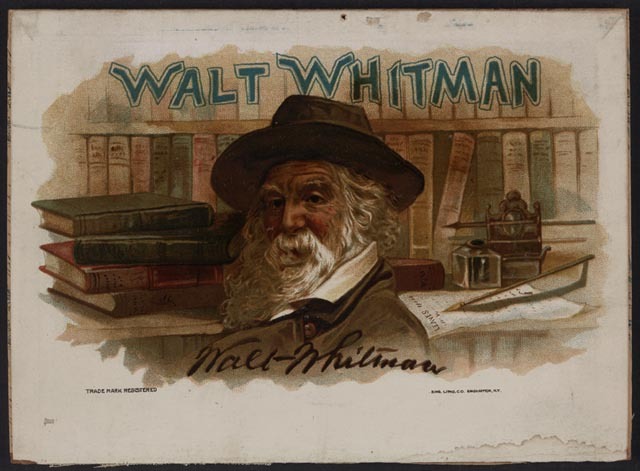 By using Whitman, Hartmann not only sold cigars, but helped to promote Leaves of Grass as well. In 1898 Hartmann created a label for his cigar box entitled “Walt Whitman Cigars: Blades O’ Grass”. This would entice the public to not only buy the cigars, but to read Leaves as well. (image courtesy of LOC and Dr. Scanlon) full link to loc exhibit below. The previous label from 1898 contained the name of the product, “Blades O’ Grass”, but here we see an evolution in advertising, not only because the company used professional lithographers, but because they wrote a slogan that is not product centric, but taps into the personality of Whitman himself. Here Hartmann and Son is truly selling an image. They are tapping into the concept of Whitman as the lazy, comfortable poet. A man of men who might sit down and enjoy the occassional cigar. And therefore the public sees cigars as a way to relax, as a way to live the life of a poet for a couple of minutes. Finally, in other news, the above image has become an emblem of popular culture. 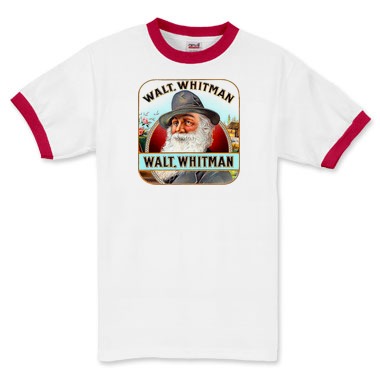 While Googling I discovered Whitman’s image emblazoned on t-shirts sold on a punk clothing website (they are actually sold on a few different sites). I have provided the link below for your viewing pleasure. The idea of Poetic Comfort has gone punk. Here’s a picture to entice your buying power. The shirt is available in 9 different colors, but i liked the red best! the full link to the site is below. Enjoy! And here’s to Whitman’s work remaining a part of our culture and Whitman himself remaining an icon.